Greetings again from the darkness. Actors becoming directors is a Hollywood tradition going back many years, although it seems to be quite the trend these days. Just within the past 3 weeks, there have been feature film directorial debuts from Bradley Cooper, Jonah Hill, and now Paul Dano. You surely know Mr. Dano from his work as the uber-quiet brother from LITTLE MISS SUNSHINE, his dual role in THERE WILL BE BLOOD, and his turn as the early years’ Brian Wilson in LOVE & MERCY. He’s a talented actor who now flaunts a near-master’s grasp of filmmaking. 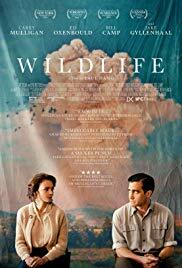 It’s Montana in 1960 when we meet the Brinsons, a typical family of dad Jerry (Jake Gyllenhaal), mom Jeanette (Carey Mulligan), and 14 year old son Joe (Ed Oxenbould). Jerry is a gregarious golf course employee, Jeanette is a former substitute teacher – now stay at home mom, and Joe is a mostly normal teenager who only attempts to play football in order to make his dad proud, and needs his mom’s help on his math homework. Jerry drinks a few beers each night and Jeanette cooks a nice family dinner. Nothing to see here. This idyllic world is shaken to its core when Jerry gets fired from his job for not respecting the boundaries with club members (not what you’re thinking), and his manly pride won’t allow him to return to the job when the club reconsiders. Jeanette does what moms do – she takes a job as a swim teacher at the local YMCA to tide them over until Jerry can find a new job. It’s at this point when we realize son Joe has extraordinary observation skills for a teenage boy, and he has a front row seat to a disintegrating marriage. Bearing the shame and frustration of a man in this era who can’t provide for his family, Jerry abruptly leaves to go fight an out of control forest fire in the mountains. Joe longs for normalcy – the only life he had known to this point. Joe watches in quiet confusion as his mother evolves from doting housewife and caring mother to something and someone he doesn’t recognize. She changes how she talks, how she dresses and how she acts. Jeanette is experiencing the contradiction of knowing she needs a man, and not liking that feeling one bit. She latches on to a local car dealer named Warren Miller (Bill Camp). Miller is basically a master-predator seizing on his injured prey through the power of money and promise of stability, and this makes for some uncomfortable situations both for us as viewers and for Joe watching his mom. This is a family drama that doubles as insight into the changing times – what defines happiness, what role to women play, how involved are kids in household. Based on a book by Richard Ford, the screenplay is co-written by director Dano and his long-time girlfriend Zoe Kazan (RUBY SPARKS, 2012). The story is one part feminist, one part coming-of-age, and one part societal shift. These are fully drawn, complex individuals that walk, talk and react like people tend to. As Jerry, Jake Gyllenhaal is excellent in his limited scenes, and Ed Oxenbould is an intriguing young actor and captures the essence of young Joe – especially that moment when kids realize their parents are individuals, not just devices put on earth to serve kids. This is Joe’s story, but it’s Mulligan’s film. What a terrific performance she delivers, which is not surprising, given her track record. Here she makes us feel everything Jeanette feels, and though this isn’t the kind of movie to reach out and grab you, Ms. Mulligan’s performance likely will. There is an expressive score, heavy on the woodwinds, from David Lang; and the cinematography from Diego Garcia is also spot on for era – as is the authentic set design. Mr. Dano has delivered an exceptional piece of filmmaking for what will likely be a very limited audience. Those that seek it out will be rewarded. This entry was posted on Tuesday, October 23rd, 2018 at 10:40 pm and is filed under Drama. You can follow any responses to this entry through the RSS 2.0 feed. You can leave a response, or trackback from your own site.